Safety Tips for the Home - find more: EMF Action Guide. Baby Monitors. There isn't a safe one on the market. If you really must have one, try to have just audio and not visual which has a stronger signal and keep it as far away from your baby as possible. Computers. Try to have them wired, not WiFi. If not wired, say on a laptop or chromebook, etc, don't use it when it's plugged in, that makes it worse. When plugged in, you're using a worse type of current. Your cell phone is worse when it's plugged in as well. Using a laptop is safer than using a desktop because desktops have to be plugged in. Using a laptop with WiFi turned off is even better. If you have to use a desktop, there are filters you can buy to clean dirty electricity. Use two filters per desktop. WiFi. The ideal situation is to have everything wired and skip the WiFi. If you must have WiFi, go to Home Depot or Lowe's and get an outlet timer. Plug your power cord for your WiFi into that timer and set it to be off at night when you're not using it. Give your family a span where it's not transmitting. Also, have the router as far as away as possible, especially away from your kids. Cell Phones: As much as possible, keep your cell phone in airplane mode with the WiFi turned off, especially for your children. Why do they need a cell phone anyway? The radiation penetrates their brains much deeper, much worse than adult brains. If your kids are playing games on the cell phone, you can have it in airplane mode with the WiFi turned off. Always use head sets, never use Blue Tooth. There are actually warnings deep in your phone's settings about not using your headset. Laws are being drawn up to ensure cell phones must be sold with headsets. Keep your cell phones away from your body as much as possible. Keep it near a window so every time it looks for a signal, it is not pinging your body. Studies are proving that cell phones stored in a woman's bra have directly led to breast cancer. Studies are proving that cell phones in men's pockets are leading to infertility. Teenagers seem to be especially difficult to convince to take this issue seriously. As a parent, do what it takes to protect their health. Dr. Libby's advice? Bribery actually works. Monitor their phones. Each time you find it in airplane mode with the WiFi off, you reward them. Electric Meters. Most electric companies now use Smart Meters to monitor your electricity usage. These smart meters transfer information a set amount of times and each time it is responding, it is dangerous to your health. Look at your electric meter. If you have 5 clock looking things, you’re ok, it's still analog. If there’s a number, digital number, you need to take action. If you have a digital meter, call the electric company. Find out how often that signal is transmitted, and is it transmitted through space or through wire? Then you can purchase a material, similar to tin foil, to put around the meter, wrap it, look for videos on how to do it – don’t want to focus it to your neighbors, either, encase the whole thing. Some companies come out and do it. You, legally, aren’t supposed to touch the meter. Also, you could call and see if you can opt out, swap your digital meter for analog, which might require a small fee. I recommend paying the fee to have someone come out and read it. Where is that meter located? Do you have a child sleeping next to that wall? Move them away right now. Same thing with major electronics. Fuse boxes and main energy sources, get kids away from them, a WiFi router – get it away from blasting yourself. Fridges give out a lot of dirty electricity as well. Light Bulbs. Light bulbs have become an issue for dirty electricity now as well. Just use the old fashioned ones, they are a lot safer. LED Bulbs. 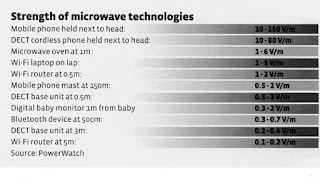 Microwaves. Just don't use them. If you must use one, stand as far away from it as possible while it is in action. Here are some tips for cleaning yourself from your exposure to EMF and RF radiation. First, test your house and buy filters. Then, take an Epsom bath daily or several times a week. Spend a few minutes each day with your bare feet in the dirt. Spend a few minutes each day simply standing on tin foil. Yes, this works, all that excess energy flows out into the foil. Do it at night while brushing your teeth. Should you use those expensive grounding mats or grounding sheets? If you're in the US, England or Australia – don’t do it. If you do it, you’ll be bringing IN that dirty electricity. You’re plugging in a very expensive fabric covered tin foil. You plug it in, then you’re bringing that electricity into it and then you lay on it. That dirty electricity goes through it. If you stand on it NOT plugged in, it works. But it works just like tin foil! Just buy tin foil. Check your symptoms of radio wave sickness here. Once you are protecting your children at home, what should you do about school or the dance studio or wherever they spend a lot of time? Find out where their WiFi routers are located and make sure your child is not near them. Then offer to buy filters for the classroom. Talk to the principal or school superintendent. Arm yourself with research from Stetzer Electric. Once they are aware of this, they may offer to test the rooms for dirty electricity and put filters as needed. Some people get shielding clothing for their children, but this is usually difficult for the children. France has already outlawed dirty electricity and more places are outlawing WiFi in public schools. The following research is from 2014. I'm sure there is updated information elsewhere, but this can get you started. The labyrinth of YouTube is exhausting to me. Besides, I need to go get my feet in the dirt right now. Love you, mean it!